Featured Donor and Scholarships - SRU Foundation, Inc.
​​Second Chances: John Butch and his wife Beverly believe in second chances. John, himself, is living proof of what a second chance can do for someone. During his first years at Slippery Rock University, he struggled, eventually leaving SRU with a less than acceptable GPA. He was drafted into the US Army and served in Vietnam. After returning home as a veteran, John was given a much appreciated “second chance” by Al Schmittlein, a Vice President of the University, to continue his education at The Rock. Upon graduation, John was hired by the SRU Computer Center as a Systems Analyst and earned an MBA from Youngstown State University. He then went on to a long career in Information Technology. Because someone gave him second chance, John and his wife Beverly, who is also an SRU grad, are passionate about doing the same for others, especially for veterans returning to finish their careers at SRU. For this reason, in 2018, John and Beverly created the Veteran Readmit “Second Chance” Scholarship. This scholarship is for an Honorably Discharged US Military Veteran who has been readmitted to SRU after military service. Beverly and John were both freshmen at SRU in 1966, but began dating in 1969 when they met in Pittsburgh while John was attending computer school and Beverly was student teaching. The couple now looks forward to hearing new stories of second chances from the students awarded this scholarship, maybe stories not too different from their own. ​Anatomy, physiology, statistics… these are the names of classes that strike fear in the hearts of students. These were some of the classes that Dr. Elmer B. Cottrell taught when he worked for Slippery Rock University. Yet, he also taught gymnastics and lifesaving. In fact, Dr. Cottrell was a diverse and talented man who wore many hats while a faculty member on campus. He served as assistant football coach, assistant basketball coach and head gymnastics, tennis, golf, and swimming coach. Dr. Cottrell drew up plans for the East-West Gym swimming pool which was the first swimming pool on campus and then started the competitive swimming program. In 1970, posthumously, he was elected into the Pennsylvania Swimming Hall of Fame. 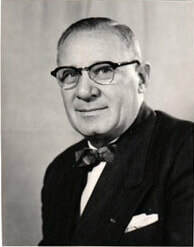 This tireless man worked at SRU for 25 years from 1923 to 1948 and then retired to work for the Commonwealth of Pennsylvania as the Director of Health, Physical Education and Recreation. He served in that position until his death 11 years later in 1957. Dr. Cottrell was also founder of PSAHPERD, The Pennsylvania State Association for Health, Physical Education, Recreation and Dance, which is having its 97th convention this year. Each year PSAHPERD gives out 16 Awards including Teacher of the Year Awards and Athletic Director of the Year. The highest award that this organization gives is the Elmer B. Cottrell Award to recognize exceptional service and leadership to PSAHPERD and the profession. In 2004, his children, Eleanor Cottrell Hartzell ’39 and Dr. Edwin Cottrell ’43, decided to pay homage to this amazing man by establishing a scholarship in his name. The scholarship is a tribute to their father’s life-long commitment to the advancement of health and physical education. Mr. Shapiro strongly espoused equal higher education for women as well as men. One of his proudest achievements was that, in the nineteen fifties, he was able to educate all three of his daughters to degrees beyond baccalaureate. After passing, and because he believed that lifelong education was achieved through reading and travel and academic pursuits, his wife, Dr. Charlotte H. Shapiro, established the Leo I. Shapiro Lecture Series. This program was designed for undergraduate liberal arts students. The Series evolved into a scholarship to recognize an outstanding student in the field of History or Political Science to perpetuate Leo Shapiro’s zeal and enthusiasm for higher education and advanced learning.